If strawberries don’t make you salivate stop right here. For those who wish strawberry season lasted forever, or at least as long as it does in California, and can never have enough strawberry recipes here are three super simple ways to enjoy your berries. The first is a recipe we found on Epicurious and adapted. It’s originally from the May 1997 issue of Bon Appetit. 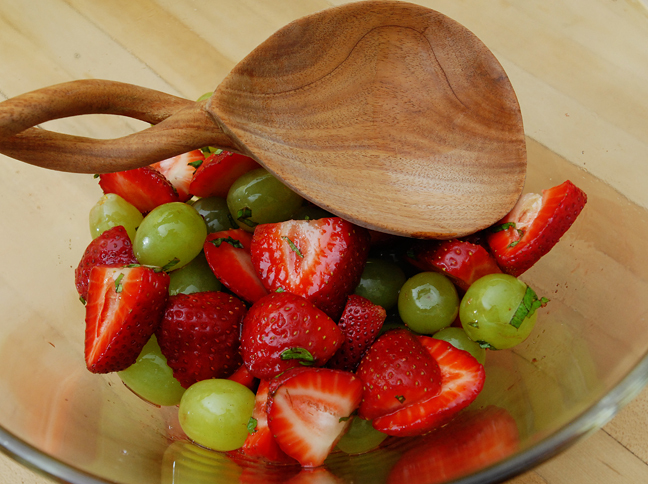 Combine all ingredients in large bowl; toss to coat fruit. Cover and refrigerate one to four. In two quart saucepan cook balsamic on low heat until reduced and thick. Once thick, toss with strawberries and basil. Refrigerate for a few hours before serving. I never add sugar, but feel free to if the syrup is still a little sharp. This is great to toss over salads if you have leftovers. Stir sugar, lime juice and water. 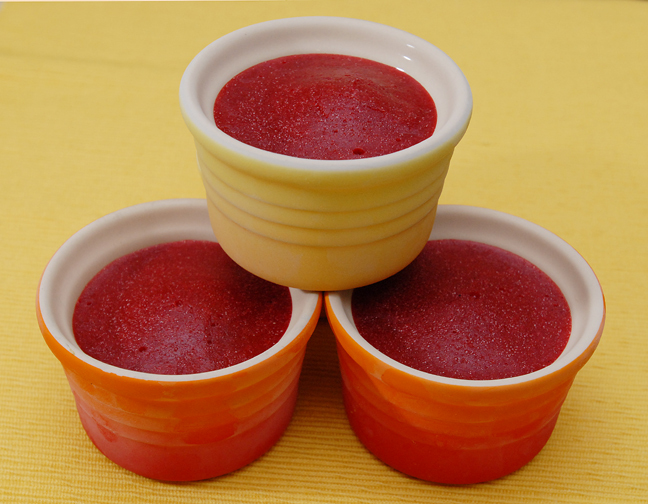 Puree berries and simple syrup. Pour into an 8-inch pan and cover with foil and place in freezer. When icy around edges, stir and place back in the freezer. Repeat a few times. (Although, if you forget it won’t be the end of the world.) To serve scrape top and scoop icy shavings into dessert bowls. Still want more? Try strawberries in Grand Marnier or mixed berry zabablione. And if you’re really good, I’ll post the strawberry shortcake my wife made for our anniversary. This entry was posted in Dessert, Food, Recipes and tagged quick, strawberries. Bookmark the permalink. What a spectacular post. I think I’ll be picking up some strawberries the next time I’m at the grocery store! Oh wow, and I’m going to try the black pepper! 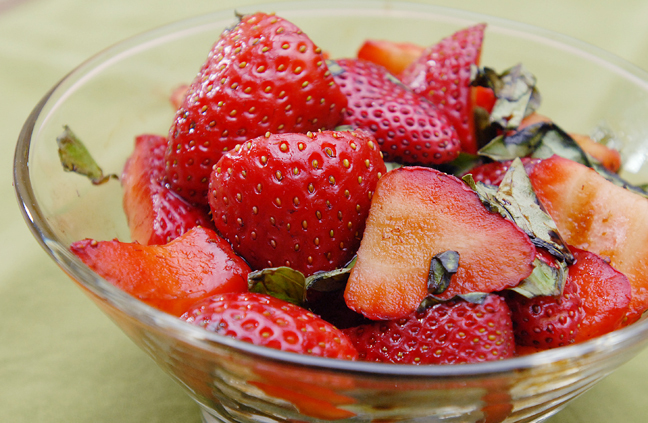 I love strawberries and I love simple recipes that produce knock-out results! Your 3 recipes are all that. I very rarely get strawberries here in Mauritius but will make up for last time when I return home later this year. Oh wow. I’m out of strawberries now too! Aghhh! Oh! These all look amazing. I want them all!!! I can’t wait until the summer to try these! Thank you for sharing. Im drooling. Fresh mint is such an excellent mix-in to any fruit dish, love that suggestion! We have two big pots of it, so you’ll see plenty of recipes that call for mint here! Yep, we got two big pints at the farmers market this weekend. It’s amazing how early stuff comes in down here. Although, aside from greens and berries, there weren’t many local crops. The berries alone were worth the trip. I discovered strawberries and balsamic a while back, and I am hooked! That salad looks super Yummy too! I bet that’s amazing. We have our oils and vinegars broken into categories too. Every day and special occasions. We like an olive oil from an Italian family that moved to Napa. I doubt it compares to ones you can buy! Strawberries are my absolute favorite. I love the granita you made, that looks wonderful. I usually eat mine the plain way, with a little sugar and the strawberry is my gift. I do wish strawberry season lasted longer. Yumm-o! Does this mean it’s almost strawberry season? 🙂 My husband hates strawberries for some reason … can you imagine? Love the second recipe! I’ve got a basil plant that I don’t know what to do with the fresh basil, so this is perfect. Rufus’ Food and Spirit Guide is fast becoming my go to ercipe source! Thanks, Sean. You could do loads with fresh basil. Pizza, marinara, bruschetta… OK, obviously a bit biased toward Italian foods here. Ah, you’d THINK I could do loads with basil, but alas I’m the butter knife invited to a sword fight when it comes to cooking. I have, however, managed a basil pesto. Does that count? That counts. You could freeze some for later use if you’re worried the basil will go to waste too. Ohhhhh can’t wait for strawberry season here in Boston. Thanks for visiting my blog and commenting today. Come back soon! strawberry are the best type of berries..after blueberries of course. And such a neat spoon!…where’d you get it!!?? Oh. My. Gosh. Your photo is amazing! Definitely salivating! I can’t wait to make the strawberry granita. Thanks for commenting on my blog. I’ve added yours to my Google Reader and look forward to reading your future posts! Thank Chef Pandita! She linked to your fabulous naan. Wow that looks delicious! I love that they are simple to make and the salad looks so refreshing! I have fresh mint in my garden and two strawberry plants. Great ideas. thanks for stopping by my Zest of an Orange post today. I am going to make this granita! Sounds inviting and delicious. And you know a bit of orange zest wouldn’t hurt it either. This is an absolutely amazing post, among many. You have a new subscriber! I love the strawberries with the balsamic. Great idea! I have some raspberry balsamic that would be perfect, now all I need is some strawberries. I love strawberries! These look great. Definitely make me want summer now! I like the idea with the balsamic especially over spinach for a salad. I LOVE GRANITAS!!!!!!! LOVE LOVE LOVE. Where in California do you live? I’m originally from the bay area and miss those farmer’s markets…fortunately right now I live in the Florida/Georgia area and we have TONS of strawberries from Tampa. We lived in San Diego for five years, but are now in Arkansas. Tons of local and Florida strawberries here. oh wow! i think some strawberry granitas will be on the menu next time i host wknd brunch! thanks for the fab post. Thanks for your comment. Fantastic post and pictures. I just picked up strawberries from the grocer, so I’m going to try your first recipe tonight with grapes and mint. Thanks for a fresh take on strawberries! Thanks, I saw your comments on The Boogie Blog and figured you had good taste! Mmmm, enjoying reading your posts. Thanks for coming over. We love the Chef in Disguise! Pingback: Balsamic Strawberry Basil Pizza | bake me away!